The picture above shows me in November 2016. Catriona Shearer (on my left) had declared I was the winner in the ‘Quality Improvement Champion’ category at the Scottish Government and Healthcare Improvement Scotland Quality Improvement Awards. On my right is Mark McDonald (Scottish Government Minister for Childcare and Early Years). The minister said to me, ‘Congratulations – a popular choice by the sound of it’. I answered a tad too loudly, ‘Thanks very much Martin’. Martin?! By now, multiple cameras were pointing at us. Trying to smile I couldn’t help internally cringing at my faux pas. Winning was not the only surprise of the night. One of the reasons I was nominated was my improvement approach in NHS Lanarkshire as a midwife improvement advisor. I loved my job. I was always looking for dynamic ways to engage my colleagues in this funny world of quality improvement and improvement methodology. , I decided to draw attention to our data by pinning some minions from the film Despicable Me on our quality improvement board. We had Kevin presenting postpartum haemorrhage work whilst Stuart proudly highlighted Maternity Early Warning Score chart testing – it worked a treat. What does this have to do with my award? As I was about to make my stage exit, from nowhere a bright-yellow object was hurled towards me. I wondered if I was being heckled, but eventually I realised what was happening. My lovely team at NHS Lanarkshire bought me the minion as a sort of tribute. I laughed for the next hour. What a lovely gift and extremely thoughtful idea! Enough self-promotion! I’d like to encourage you to think about nominating someone for a QI Award. The night was incredible – one of passion and pride at what Scotland is achieving. Celebrating this commitment and passion through the QI Awards was a brilliant opportunity to network, learn from others and spread the good work. Every finalist had a video presentation of their improvement project. They were emotional to watch – we were all glued to them. All featured front-line staff with a passion to improve using improvement methodology to better outcomes. Each project had a positive impact on a mum, dad, granny, baby, three year olds, five year olds, all of us in the room, the list is endless. There were tears during some at the stories and a public display of respect for winners and runners up. 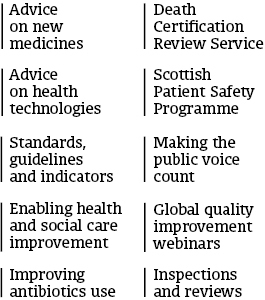 But this is just a handful of the incredible work ongoing across Scotland. As I type I am looking at my award and reflecting on the improvement work I was privileged to be part of and impact it had on the families and staff. You may have noticed past tense being used a lot. The last 12 months for me have been life changing professionally. I now work in Healthcare Improvement Scotland as an associate improvement advisor, managing the SPSP maternity care programme. I am a midwife, and despite not working in a clinical role, I will always refer to myself as a midwife. Although I have moved from the ‘clinical field’, I now support colleagues across Scotland to improve the safety and quality of maternity care, and I love this new role. I am extremely honoured that someone took the time to nominate me for the QI Awards and that I was shortlisted and crowned a winner. It was a brilliant night to be shared with colleagues who are all working hard to improve the lives of others. Is there someone in your area of work who is deserving to be nominated of this category or others? If so, take the time to apply to the awards. You just never know what it could do for the individual, team or NHS board. By nominating, you are helping spread the word about the best that is going on throughout the child’s journey. Who knows, the nomination, and the story behind it, might inspire someone else to start an improvement journey of their own. Go on, do it.